Want great Myrtle Beach articles, events and deals sent straight to your inbox? Sign up for our newsletter today! Planning a vacation in Myrtle Beach can be fun! The kids are filled with excitement, there is a countdown on the calendar, and a list of fun things to shop for before the trip. But, if you don’t plan ahead, you may find yourself stressing out over what is supposed to be a fun and exciting vacation to Myrtle Beach. Planning ahead is key to ensuring a stress-free endeavor! • Do you have a location preference? The north, central, and south sections of Myrtle Beach all offer different atmospheres and proximity to different attractions. • What size unit are you looking for? Accommodation styles and sizes range from small efficiencies to spacious multiple bedroom condos. Other options include whether you want a full kitchen, private bedrooms, and an ocean view. • What is your budget? Many things can affect the rate of rooms; the time of year you want to visit, the size of the unit, and whether or not the room is oceanfront are just a few variables to consider. If you are on a budget, consider whether you could live with a smaller room or without the oceanfront view. Or, consider coming before or after prime vacation season. The weather will still be ideal for beach-goers and you will miss out on the crowds! • Are amenities important? Different hotels and resorts offer different amenities – some are great for families while others are more suited for couples or adults. Check out our amenities comparison guide and room type comparison guide to narrow down your choices. 2. Pick your dates: If your dates are flexible, start off by searching various dates and checking out the best and latest specials. If you aren’t flexible, that’s ok too! Just search the dates you want to stay and you will get the best available rate. Be sure to book as far ahead of time as you can, because resort rooms in Myrtle Beach fill up fast, especially during the summer and near holidays. Plus, booking early can also save you money and remove the stress of whether or not you have your room reserved. 3. Plan Activities: Once you have your accommodations selected then you can start planning the details. Do you want to spend most of your time on the beach? Do you want to visit a lot of attractions or see a lot of shows? Check out our Myrtle Beach section on our website to narrow down what attractions and shows your family wants to visit. Sometimes you can even add tickets to these during the checkout process when you book your room. Also, check out our Myrtle Beach discounts page to see where you can get exclusive deals and discounts! 4. Start Saving: Make an effort to save extra money between when you book and when you depart. Though budgets are great, things do come up. You don’t want to miss out on souvenirs, an extra meal or two out after an exhausting day at the beach, or that one attraction that the kids just can’t resist. Be sure to have a realistic budget in mind and a little cushion as well in case anything extra comes up. 5. Kick Back and Relax: Now that you have your trip planned - you can relax! Start counting down the days and let yourself get excited about your upcoming trip. 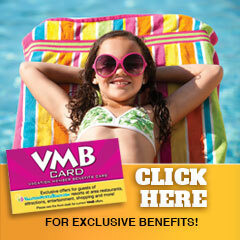 It will truly be a vacation to remember, whether it is your first time in Myrtle Beach or your 30th time! Do you have any other Myrtle Beach vacation planning tips? Comment below and help other guests with a smooth planning process.